This project consists of road safety presentations delivered by local road safety officers, Police and Fire & Rescue Service staff. It is directed at small groups and is delivered in a rotation of approximately 20 minute duration. Using this format it is possible to engage with approximately 200 plus pupils in a day. The programme stresses the positive aspects of driving and the benefits it can bring to young adults. It also allows the team to focus on a variety of issues affecting young drivers such as speeding, peer pressure, seat belts, drink and drug driving and the illegal use of mobile phones. The presentation is multi format and multi media commencing with a True/False question and answer session designed to test pupils' current awareness of road safety issues. Currently being delivered to schools and colleges, CSI is directed at 16-18 year olds. 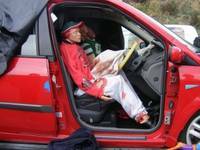 The messages are hard hitting about the consequences of Road Traffic Collisions, but it offers the 2 students information and strategies to ensure they avoid becoming casualties. These themes are developed through PowerPoint and video presentations and culminates with a 20 minute interactive session centred around an impact vehicle - an idea developed by North Wales Fire & Rescue Service (this is a modern vehicle that was obtained from the Traffic Research Laboratory in Wokingham after it had been submitted for crash testing and is populated with realistic mannequins. This allows the officers to speak with authority and accuracy about the consequences of road traffic collision. The road show has received very positive feedback in schools and colleges from staff and pupils alike.